Some of you will know of my long term association with the post-punk, darkwave band Attrition. I have lent my vocals for several recordings, including The Unraveller of Angels album, and sometimes I join them on tour. I lent some vocals for Attrition’s latest album, “Millions of the Mouthless Dead,” but in the end, they didn’t quite fit the project. Now… some people might be upset to have their entire contribution to an album dashed aside, but having worked with Martin Bowes for several years now, I knew that whatever decision he made was in the best interest of the album…. and indeed… my vocals would have ruined this masterpiece! Whenever possible, I prefer to listen to music in a dedicated setting, where I can give it my full attention. Being a very busy woman and a mother of two, these opportunities don’t present themselves often, so when they do…. I want whatever I’m listening to to be damn good! When I finally got a chance to sit down and listen to Millions of the Mouthless Dead, I knew within the first 60 seconds that the next 50 minutes would be well spent. Not even one minute into the album, I was struck by Martin’s voice. It’s the same whispery, gravelly voice as always, but it had a particular lushness to it that really grabbed my attention. You can hear in Martin’s voice how near and dear this album is to his heart… and with good reason. 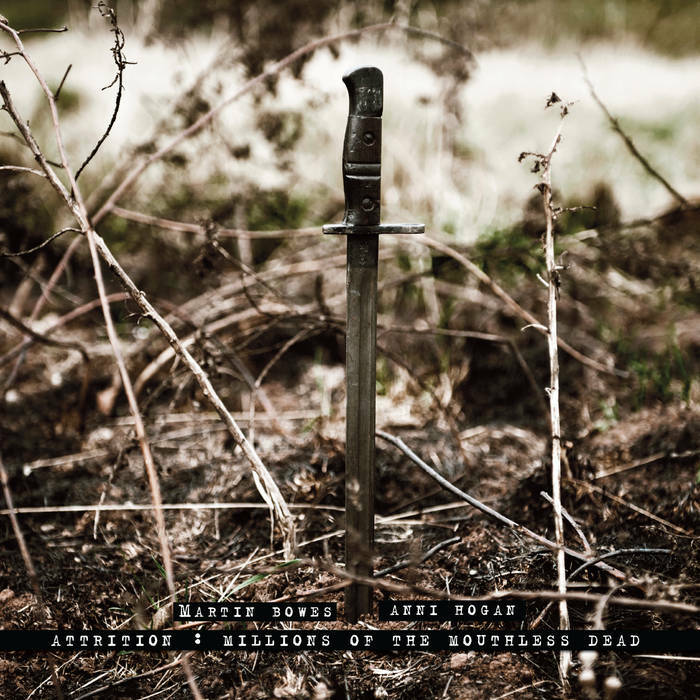 Millions of the Mouthless Dead is an album inspired by and dedicated to William Bowes (his grandfather) and the millions of people that experienced the living hell of World War I. The album was many years in the making, released to coincide with the 100 year anniversary of the war as a form of memorial. 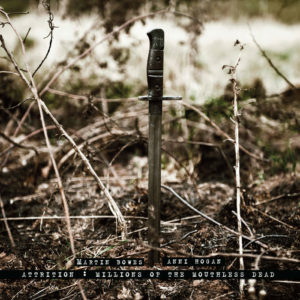 Rather than pulsating beats and operatic vocals, like most Attrition albums, Martin has created a soundscape to recreate the trench warfare, interspersed with spoken poems read by several different people – men and women – in multiple languages. Also interspersed throughout the album are Anni Hogan´s stellar pianistic skills adding both warmth and dissonance to the mix. The sound design is stunning! Martin has crafted and manufactured the sounds of war, using samples both obvious (like gunfire) and not obvious (such as the sound of a washing machine). My favourite apsects of this album are the different perspectives from French, German and English people reading original war poetry. This creates a narrative that doesn’t so much follow the progression of the war (although there is a nice salute to America’s late-as-usual arrival), as the progression of the lives affected by the war. “A Madman’s Flash,” which occupies three tracks titled “As Quiet As,” “All The Mad Men,” and “Krieg,” is without a doubt a jewel of the album, where the soundscape starts to crumble into insanity. The title track “The Mouthless Dead” is the most “Attrition” song on the album, in that is has the most graspable beat. For me personally, however, it isn’t the highlight, as one would often expect of the title track. For me… the most chilling moment is during the last track, “A Drawing Down Of Blinds.” The spoken words, “Goodbye Dear” followed by a fade in of church bells are a perfect reminder that nothing came of that war except death… and then more death. This album is – in my opinion – a highlight of Martin’s career. I’m grateful for just being privy to the process and having a little ghost of a vocal on the track “Divine Providence”… but also, I’m grateful because my vocals that found no home on this album became a little masterpiece of their own.